Srila Srinivasa Acharya (1517-1613 AD approx) was a great spiritual master in Gaudiya Sampradaya, the line of Caitanya Mahaprabhu. He preached the divine teachings of Lord Caitanya in Western Bengal, mainly in Yajigrama and Vishnupura. He recovered the manuscripts of the Six Goswamis of Vrindavana. He eternally serves as Srimati Mani Manjari in Lord Krishna’s abode Goloka Dhama in the spiritual sky. He is the ‘Gaura Shakti’ or the power of Lord Gaurahari. Bhakti Ratnakara of Srila Narahari Chakravarti gives a detailed account of the pastimes of Srinivasa Acharya. Srila Srinivasa Prabhu belongs to the bona fide sect of Lord Caitanya, which can be traced back up to Brahma, the creator of this universe. Gangadhara Bhattacharya and his wife Lakshmipriya were both exalted devotees of Nimai Pandita (or Lord Caitanya as he was known before renunciation or Sanyasa). Gangadhara was a scholar and he lived in the village Ghanteshwari, situated near the city of Burdawan. He decided to go to Mayapura to meet Nimai Pandita. Katwa is on the way from Ghanteshwari to Mayapura. There lived his old friend Keshava Bharati. He made a plan to first meet Keshava before proceeding to Mayapura. The devotee replied, “You have no need to go to Mayapura, Lord is here in Katwa at Keshava Bharati’s house because …” But Gangadhara rushed to see Lord Gaurasundara without waiting for the sentence to finish. Gangadhara was very happy because he didn’t have to go all the way to Mayapura. He could now see Lord Caitanya in Katwa, and that too in his friend’s house. Two joyous things could be done at the same time. But his pleasure was not destined to last long. There was a big crowd at Keshava Bharati’s house. Gangadhara somehow made his way through it. He saw a very effulgent golden man with a shaved head. He was Nimai Pandita. Gangadhara got quite depressed when he saw the beautiful hair of Lord lying on the floor. He was remembering the beautiful Nimai Pandita who had curly long hair. Further, he was shocked to see that Lord has accepted the saffron renunciate clothes instead of his usual beautifully ornamented garments. Keshava Bharati was going to give Sanyasa initiation to Lord Nimai, when all the devotees said, “Please stop it! We can’t see You as a renunciate, O Lord.” But Lord Nimai took Sanyasa and was given the name Sri Krishna Caitanya Mahaprabhu. Lord Caitanya went to Puri. Gangadhara returned to his village Ghanteshwari in a very sad mood. Seeing this devotion the villagers named him Caitanya Dasa, or the servant of Lord Caitanya. 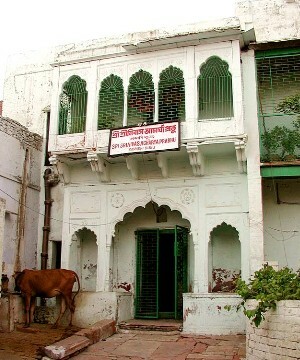 Caitanya Dasa Gangadhara, along with his wife Lakshmipriya, went to Kshetra Dhama Puri. They wanted to meet Lord Caitanya, the center of their life. Lord had gone to Puri after accepting renounced order of life. Caitanyadasa and Lakshmipriya went to the famous temple of Puri, where Lord Jagannatha is worshiped with His brother Balarama and sister Subhadra. It was a clear indication that two great personalities, Narottama and Srinivasa, were descending to this planet very soon. When the couple returned back to Ghanteshwari, also known as Chakhandi, Caitanya Dasa was getting more and more absorbed in the unalloyed Bhakti of Sri Caitanya Mahaprabhu. He was highly respected by the saintly people of the village. Everyone said that he is the embodiment of the pure devotional service to Lord Krishna. But some critics blasphemed that Caitanya Dasa is only a beggar. He has lost his wealth and has no children. He is not a renunciate but behaves like one. If he has no interest in the family life, then why is he maintaining it. Caitanya Dasa never responded to such foolish speculations. He was maintaining the family by the will of Lord Caitanya. Very soon, he would become the father of an exalted personality. And moreover the family was not in any financial crisis. It was 1517 AD, full moon day of Vaishakha month, when Srinivasa appeared. At that time his father was on a tour, so there was no one to assist Lakshmipriya. It was a very auspicious day because Lord Gautama Buddha also appeared on this day. From his very infancy, he was showing signs of his devotion to Lord Krishna. Srinivasa would cry out of separation from Lord Govinda. But when anybody would chant, “Gaurahari! Gopala! Govinda! Mukunda!”, he would immediately stop crying. The boy was very attractive. Just as Caitanya Mahaprabhu predicted and Caitanya Dasa desired, the boy resembled Mahaprabhu. Caitanya Dasa was very happy to see the boy. The boy soon began crawling. He was as attractive as a magnet. All the ladies of the village wanted to play with the baby; they wanted to become part of the transcendental pastimes of a Mahabhagvata, the pure devotee of the Lord. The boy started to walk with the help of his mother’s finger. Sometimes he would fall and cry, while his mother would try to pacify him. Boy repeated the names in his sweet childish language. Everyone was enchanted on hearing the voice of Srinivasa. Srinivasa was sent to the school after his sacred thread ceremony. He began to study under Dhananjaya Vidya Vachaspati. This renowned scholar was surprised when he saw the grasping power of Srinivasa, who mastered even the most difficult commentaries. Srinivasa became a famous scholar of Chakhandi. He was an expert of Sanskrit, Bangla, logic, political science, medicine and religion. He was loved by all the people of the village. Caitanya Dasa would tell the stories of Lord Gaurahari to his son. Both cried out of divine bliss when they would absorb themselves in the nectar of the pastimes of the Lord. Caitanya Dasa also narrated the stories of Rupa Goswami and Sanatana Goswami. Srinivasa went to Shrikhanda with his father Gangadhara, who left his son in the abode of Srila Narahari Sarakara Thakura. Meanwhile he himself got engaged in some important work. Narahari was a Maha-Bhagwata, or the devotee of the highest order. He wrote the famous book, Bhajanamrita. Lord Caitanya didn’t allow anyone except Narahari to sing His glories in His presence. Lord would forbid others out of humility, but He considered Narahari non-different from His own divine self. This favor of Lord on Narahari impressed Srinivasa. He learned many important things about Vaishnavism from this great soul. 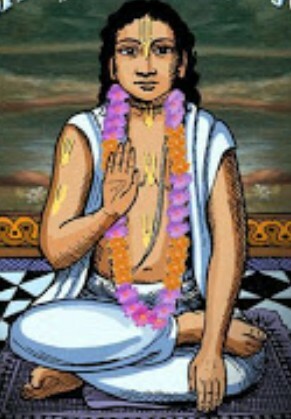 Srinivasa accepted Narahari as his spiritual master. He was willing to execute every command of Narahari. In this way Narahari became first Guru of Srinivasa. Srinivasa wanted to become an initiated disciple of Narahari. But he was denied and informed that Lord has something else in His mind for him. Narahari told him that he should go to Puri to meet Lord Caitanya. Srinivasa wanted to go to Puri. He urged his parents about this but they said that he is too young to travel such a big distance alone. Gangadhara Bhattacharya, the father of Srinivasa, left this mortal world, leaving all responsibilities on his only child. Srinivasa didn’t want to engage in family life but he had to take care of his mother. He and his mother shifted to Yajigrama, where his maternal uncles lived. He said to his mother, “Srila Narahari Prabhu instructed me to go to Puri to see Lord Caitanya, but I am still here. Please let me go to Puri.” His mother didn’t want to lose her child, so she denied. One night, Lord encouraged him to go to Puri. So finally Srinivasa Acharya left his mother in the care of his uncles and grandfather and then started for Puri. On his way, he shaved his head and accepted simple white clothes. He was very excited about seeing Lord Caitanya. But his happiness was not destined to last long. He met some brahmanas, while he was traveling. They were coming from Puri. Tears began to flow from their eyes. Srinivasa guessed that something is wrong. He urged the brahmanas to tell everything in detail. Srinivasa’s pain of separation was unbearable. He couldn’t imagine Puri without the Golden Lord Caitanya. He was planning to commit suicide. That night, Lord Caitanya appeared in his dream and ordered that he should continue his journey to Puri. He will meet Gadadhara Pandita Goswami, Swarupa Damodara, Ramananda Raya, Kashinatha Mishra, Sarvabhauma Bhattacharya and many other associates of Lord there. So Srinivasa continued his journey, and after some days reached the holy Dhama of Puri. He visited the Narendra-Sancha lake on the way. Here he recalled the water sports of Lord Caitanya. In Puri, he found everyone was in great distress. They all welcomed him, but he saw a pain in the hearts of devotees. It was the pain of separation from Lord Gaurasundara. He went to the grand temple of Lord Jagannnatha. He was enchanted by His beauty, but at the same time he got disturbed on seeing the sad faces of the priests. Finally he decided to go to Tota-Gopinatha temple, where Lord had disappeared. There he began to cry uncontrollably. Gadadhara Pandita Goswami consoled Srinivasa and took him to his house. Srinivasa introduced himself to Gadadhara. He offered his obeisances to Radha, who has now taken the form of Gadadhara Pandita. Gadadhara was an exalted soul. He was actually the most worthy man who could teach Srimad-Bhagvatam. It was only out of humility that Gadadhara declared himself unworthy. Gadadhara handed over the manuscript to Srinivasa, who placed it on his head. Srinivasa experienced a divine ecstasy. He had never felt such a joy before. Srinivasa accepted the divine manuscript of Gadadhara Pandita. 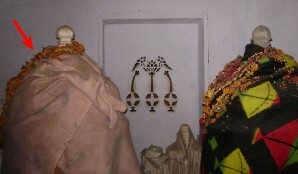 He visited the houses of Ramananda Raya, Swarupa Damodara Goswami, Gopinatha Acharya, Madhava Devi, Sikhi Mahiti, Vakreshwara Pandita and Sarvabhauma Bhattacharya in Puri. Then he left for Bengal. Srinivasa Acharya had convinced Gadadhara Pandita that he is the most worthy teacher to impart the divine knowledge of Srimad-Bhagwatam to him. And Gadadhara agreed to teach this book to Srinivasa. Srinivasa hurried to obtain the manuscript from Narahari Sarakara Thakura. When he reached Narahari in Srikhanda, he received the news that Gadadhara had disappeared. He was totally heartbroken. He spent few days in lamentation, and then he controlled his emotions by constant chanting of the holy names of Lord Krishna. He decided to visit Kharadaha to seek the shelter of Nityananda Prabhu and Advaita Acharya. He was unaware that they had already disappeared from this planet. When he came to know about their disappearance, he was totally shocked and decided to commit suicide. He prepared a pyre and lit it. When he was about to jump into the fire, suddenly the two Prabhus appeared. They consoled Srinivasa and vanished. Now he was ready to somehow move on with his life. Jahnava Mata, the consort of Lord Nityananda, had gone to Vrindavana. There she met Rupa and Sanatana Goswami. The Goswamis requested her to send Srinivasa to them at the earliest, because the time of their departure from this mortal world was fast approaching. When Jahnava returned to Bengal, she informed about this instruction to Srila Narahari Sarakara Thakura, who conveyed the message to Srinivasa. Srinivasa immediately set off for Vrindavana. But he decided to meet the exalted associates of Lord in Bengal first. First of all, he visited Navadvipa, the home town of Lord Caitanya, where Lord enjoyed his pre-renunciation transcendental pastimes before going to Puri. Srinivasa visited Lord’s house, where he met Vishnupriya Devi, the eternal consort of Lord. She lived with Her two family servants, Ishana Thakura and Vamshivadana Thakura. He was grief-stricken when he came to know that Sachi, the mother of Lord Caitanya had already disappeared. Vishnupriya cooked delicious food for Srinivasa. He had never tasted such divine food before. He stayed with Her for a few days. Srinivasa was glad to accept Her as his mother. He was amazed to see Her great devotion. Vishnupriya would always engage her in the constant chanting of the holy names of the Lord. Later, he told all devotees that She was truly the worthy companion of Lord. Ishana Thakura took Srinivasa for a tour of the holy Dhama of Navadvipa. He showed him sacred places including the house of Srivasa Pandita (where Lord would perform Sankirtana), house of Nandanacharya, the temple of Lord’s family deity (the ancient Vishnu deity), and the Samadhis of Chand Kazi, Jagai-Madhai and many other associates of Lord. Srinivasa took leave of Vishnupriya Devi and her servants, and went to Shantipura. There he visited the house of Advaita Prabhu and met His consort Sita Thakurani, and sons Gopala and Achyuta. Srinivasa went to Kharadaha, where he met Lord Nityananda’s wife Jahnava Mata and His son Sri Virachandra Prabhu. Jahnava wanted Srinivasa to stay at Khardaha for few more days, but she knew that Rupa and Sanatana were about to leave this planet very soon. So she instructed him to hurry and reach Vrindavana as soon as possible. On the way to Vrindavana, Srinivasa stopped at Khanakul where he met Sri Abhirama Gopala Thakura, the distinguished associate of Lord Nityananda. Abhirama hit Srinivasa with his divine whip, which could intoxicate anyone with pure love of Godhead. This was indeed a special mercy on Srinivasa. Sanatana Goswami had disappeared by now. Rupa was unable to bear separation from Sanatana, and he realized that he will also be leaving this planet very soon. So, he could not teach the Vaishnava philosophies to Srinivasa. He handed over this responsibility to Jiva Goswami, his nephew and main disciple. Srinivasa had to cover a very long journey. He walked for hundreds of miles to Vrindavana. On the way, he visited Gaya, Varanasi, Prayag, and Mathura. At Mathura he came to know that Sanatana disappeared 30 days ago. And even bigger shocking news was that Rupa left the planet only 3 days prior to his arrival. Srinivasa fell unconscious. After reviving, he was crying inconsolably. He was considering himself the most unfortunate person of this universe. He was not able to meet Caitanya Mahaprabhu, Nityananda Prabhu, Thakura Srivasa, Advaita Prabhu, and now he also missed a chance to surrender himself unto the lotus feet of Rupa and Sanatana. He sat under a tree waiting for his death. He found no reason to live any more. Now the pain was unbearable. By Lord’s will Srinivasa fell asleep. He saw Srila Rupa Goswami and Srila Sanatana Goswami in his dream. Next day Srinivasa, now consoled, finally reached Vrindavana. He went to take the shelter of Lord Govindadeoji, the celebrated Krishna deity of Rupa Goswami. Srinivasa showed all the signs of ecstasy when he saw the beautiful face of Radha Govindadeoji. Jiva noticed his ecstatic symptoms and recognized him as a great devotee of the Lord. He came near Srinivasa and asked his name. When Srinivasa had introduced himself, Jiva Goswami was glad that he would finally be able to fulfill the duty assigned to him by Rupa Goswami. After knowing that he is seeing Sri Jiva Goswami, Srinivasa offered his obeisances to him. Jiva took Srinivasa to the Radha Damodara temple, where Jiva would serve the deities carved by Rupa Goswami. Srinivasa also offered obeisances to the Samadhi of Rupa Goswami located within the temple complex. He also saw the place where Rupa and Sanatana gave sermons. Jiva introduced Srinivasa to the devotees of Vrindavana. Srinivasa met Lokanatha Goswami, Bhugarbha Goswami, Raghunatha Dasa Goswami, Raghunatha Bhatta Goswami, Kashishwara Pandita, Krishna Dasa Kaviraja Goswami, Subuddhi Raya and others. He also met Sri Gopala Bhatta Goswami, who asked his Krishna deity Radharamana to bless the boy. Very soon, all the Vaishnavas of Vrindavana began to love Srinivasa. He was impressed by the greatness of these saints of Vrindavana. He surrendered himself unto the lotus feet of Gopala Bhatta Prabhu, who initiated him. Gopala taught him the basics of Gaudiya Sampradaya philosophy. Then he told Srinivasa to approach Jiva for further studies. Jiva was the greatest scholar of India those days. In debate, he had defeated even the invincible Rupa Narayana, who had conquered all the scholars and philosophers of India. Srinivasa began to learn the Vaishnava literature under the guidance of Jiva Goswami Prabhupada. Lokanatha Goswami had also sent his sole disciple, Narottama Dasa, to Jiva for thorough spiritual education. Likewise, Hridoy Caitanya of Bengal had also instructed his preeminent disciple Dukhi Krishna Dasa, to take shelter at the lotus feet of Sri Jiva. Jiva Goswami had many disciples, but he considered Srinivasa, Narottama and Dukhi, his best pupils. He gave them special mercy and education. These three became very close friends. They were always together. The trio were the devotees of the highest order and the Lord had reserved some special projects for them. Jiva held a grand assembly of devotees in which he conferred the title ‘Thakura Mahashaya’ on Narottama and ‘Acharya’ on Srinivasa. After Srinivasa Acharya and Narottama Dasa Thakura Mahashaya’s turn, came Dukhi Krishna Dasa, who was named Syamananda Pandita. At this occasion, Jiva publicly announced Dukhi as ‘Syamananda’, a name secretly given to him by Srimati Radharani. Bengal was the land of Lord Caitanya and many of His most exalted associates. It was rich with Bhakti. But in some parts the message of pure love of Godhead had still not arrived. Moreover the Bengali devotees were still deprived of books on devotional philosophy. Such books were written by the Goswamis of Vrindavana. Jahnava Mata, along with many other devotees of Bengal and Odisha, had sent letters to Jiva Prabhu asking for the Goswami books. Jiva chose his three best disciples for this great task. He gave them a wooden chest containing the manuscripts of Goswamis. He arranged a bullock-cart, two cart-men, and 10 guards for the mission of taking this valuable literature to Bengal. Raja Manasingh, the king of Amer, who was a follower of Jiva, arranged special passports and utilities for the devotees. Srinivasa, Narottama and Syamananda didn’t want to lose the company of the great devotees of Vrindavana. But it was an important task that was needed to be fulfilled urgently. And their spiritual master had chosen them. Jiva and the other Acharyas of Vrindavana accompanied Srinivasa and his entourage upto Agra. Then they had to proceed alone. Srinivasa was the leader, so he had heavy responsibility on his shoulders. There was no turning back. It was the great work given to the trio by Lord Caitanya. After many months of arduous journey, they reached Vishnupura in Bengal. Raja Birhambir, the king of Vishnupura, was also the leader of a huge gang of bandits. He would plan the loots of the travelers with the advice of his royal astrologers. They would direct him to the place where he could get the maximum fortune. He was a terror for the highway and the neighboring states. He would rob the travelers passing through his kingdom. Although very cruel for outsiders, Birhambir was still a protector of his own subjects. He had made himself quite prosperous by these highway loots and encroachment of nearby territories. He had a bandit army of more than five hundred men. No one dared to cross the kingdom with any possession. King’s astrologers told him the greatest treasure is passing through his kingdom. It is accompanied by 3 holy men, 2 buffaloes, 2 cart-men and 10 armed soldiers. Birhambir sent his bandits to loot that party. It was actually Srinivasa and his companions, who were taking the “greatest treasure”- the Goswamis’ works. The bandits chased the party up to Raghunathapura and then Gopalapura, but they could not dare to attack. They were experiencing a strange fear. Meanwhile, Srinivasa and his companions were feeling safe because Vishnupura was a Hindu kingdom. They didn’t know about king’s intentions. It was a night time. The party decided to relax near the beautiful lake in the city of Vishnupura. Usually someone in the party would remain awake to protect the books. But today everyone had slept. Robbers were subconsciously afraid of Lord Caitanya, who always protects his devotees. So they worshiped Mother Kali Devi first. In fact the Goddess Herself is a devotee of Lord Krishna. So She never helps the offenders of Vaishnavas. The dacoits secretly stole the wooden chest containing the priceless literature. They rushed to present the loot to the king. Raja Birhambir was busy seeing his wealth and gifts at that time. But when he was informed that the greatest treasure stolen from those 15 men has arrived, he immediately sent for the wooden chest. King opened it and removed the silk cloth from the books. He saw only some manuscripts inside. This was not a treasure he was looking for. He opened Sri-Upadeshamrita of Rupa Goswami and read the first page of the book. It was full of nectar. It contained the most wonderful pastimes of Lord Krishna. It was indeed the “greatest treasure” which astrologers had predicted. King felt divine ecstasy. But he was not happy. He was regretful that he had stolen the holy books from the saints. At that night, an effulgent personality, who was none other than Srinivasa, appeared in his dream. He told him not to worry as he will come soon to take the books back. Birhambir is an eternal servant of Srinivasa. Meanwhile Srinivasa and his party discovered that the books are not with them. Now what are they going to do? They couldn’t execute their Guru’s order. Syamananda proceeded to Odisha, while Narottama went to East Bengal. Srinivasa Acharya set off for the capital of Vishnupura. He sent a letter to Jiva Goswami informing him about the theft. He met a gentle brahmana named Krishnavallabha on reaching the capital. The brahmana invited Srinivasa to stay with him. He was eventually initiated by Srinivasa, thus becoming his first disciple. One day Krishnavallabha took his Guru Srinivasa to the royal court, where a discourse on Srimad-Bhagvatam was scheduled. The court Pandita was giving the sermon. Srinivasa did not like the ideas of the Pandita. He was not giving a sermon according to the authorized commentaries like that of Sridhara Swami or any other genuine Sampradaya. Srinivasa tolerated the nuisance for a week and then blasted. He couldn’t tolerate Pandita’s neophyte ideas on the most confidential topic of Srimad-Bhagvatam– the Rasa dance. Pandita was annoyed and ordered the king to kill the young scholar, but king refused. He was impressed by Srinivasa. Instead, he invited Srinivasa to give lecture in place of the court pandita. Srinivasa gave a lecture based on the philosophies of the previous bona fide Acharyas accompanied by his own elaborations. Court Pandita accepted defeat. Everyone agreed that Srinivasa is the most wonderful Bhagvatam orator. And from then onwards, Srinivasa would give daily lecture. Birhambir accepted Srinivasa as his Guru. He invited him for a feast. But Srinivasa refused, saying that he had accepted a meal in the morning. So Birhambir just offered a fruit to the Acharya. King would often listen to Srinivasa’s chanting of holy names of the Lord. Finally the king was initiated into the Gaudiya Sampradaya. Now, he wished to help his Guru in his mission. Srinivasa told him all about the theft. Birhambir, now Caitanya Dasa, felt ashamed. He had no intention of offending his spiritual master. He accepted his crime at the lotus feet of Srinivasa. Srinivasa forgave the king and instructed him to stop his sinful dacoit activities. Caitanya Dasa led Srinivasa to a room where the books were kept. Srinivasa was very happy to see the books again. He worshiped them and chanted the Maha mantra. Srinivasa wrote a letter to Jiva, informing him that not only the books are retrieved, but the king has also become a devotee. Birhambir announced his kingdom to be a Vaishnava state and everyone was invited to become a follower of Srinivasa. All the bandits and many respectable subjects took initiation from the Acharya. The state was intoxicated with the love of Godhead. The Prince Gopala and the queen were initiated as well. We can still see the signs of Gaudiya Sampradaya in Vishnupura, Bengal. There people consider themselves the servants of Sri Caitanya. We may also see the Vaishnava monuments constructed by Birhambir and his descendants. Srinivasa took leave of his disciples in Vishnupura and went with the books to Yajigrama. There he also met his mother. Near Yajigrama he visited Narahari Sarakara of Srikhanda. The great soul was about to leave the mortal world. He instructed Srinivasa, his Shiksha disciple, to marry and thus please his Vaishnavi mother. Srinivasa couldn’t refuse his Guru’s order, so he married Draupadi, the daughter of a respectable brahmana of Yajigrama. He begot three daughters from her. His followers arranged a second marriage for Srinivasa, as there was no male successor to continue his family line. Polygamy was common in those days. This time he married Padmavati, who was later known as Gaurangapriya. She gave birth to 3 sons. Srinivasa went to Narottama Dasa Thakura, who was holding a grand Vaishnava festival in Kheturi. He also met Syamananda, Jahnava, Raghunandana and Virachandra there. All were very happy to know that the Goswami books had been regained. Narottama had done a wonderful preaching in East Bengal with the help of Santosha Raya, the king of that province. Syamananda had converted most of Odisha into a Vaishnava kingdom. And Srinivasa had done preaching of Gaudiya Vaishnavism in Yajigrama, Vishnupura and other areas of Western Bengal. Hence, Jiva’s mission was successful. He had chosen right people for that mission. There were now several copies of Goswami books available widely. Srinivasa began to make more and more disciples and engaged them in preaching. He would give lectures on the books of Goswamis and explain the philosophies in an easy way. Srinivasa had a large number of followers and initiated disciples. His first disciple was Krishnavallabha. He had also initiated his relatives and family members. Birhambir: He was a former dacoit king. Srinivasa initiated him as Caitanya Dasa. He converted his kingdom into ‘not merely a Hindu state’ but a ‘Vaishnava’ state. He proved to be a milestone in the history of Vaishnavism in Bengal. Ramachandra Kaviraja: He was a great scholar and poet. He lived in Srikhanda and was completely devoted to Srinivasa, his Diksha Guru. Later, he sent him to Narottama, who became his Shiksha Guru. Govinda Dasa Kaviraja: He was one of the greatest Vaishnava poets. He was the younger brother of Ramachandra Kaviraja. He wrote many songs, of which the most famous is “Bhaja Hu Re Mana“. Hemalata Thakurani: She was the daughter of Srinivasa, who also became his disciple. She was a powerful preacher who initiated both men and women. Srinivasa went to Vrindavana to meet his spiritual masters, Jiva and Gopala Bhatta. He was welcomed by the devotees there. Jiva showered his mercy on him. Gopala Bhatta earlier wanted his best disciple Srinivasa to become the head priest of the Radharama temple in Vrindavana. Till now Gopala Bhatta, who was the founder of the temple, served as the head Pujari. But after seeing the preaching capacity of Srinivasa, he appointed Gopinatha as the priest and instructed Srinivasa to continue his missionary activities. After few days, Srinivasa returned to Bengal. He would now often visit Vrindavana. A channel was created by him between the devotees of Bengal and Vrindavana. Most of the time, Srinivasa was traveling either to Vrindavana or to different parts of Bengal and Odisha. He preached traveling place to place with his disciples. He served the small Krishna deity named Jula (Jhula) Thakura. But as he was mostly on tours, he could not make a temple for Him. So he carried the deity in a bag and offered elaborate service to Him. 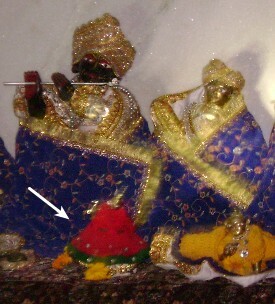 We may still see the deity in Jula Thakura temple (Srinivasa Acharya Kunja) in Dhira Samira area, Vrindavana near Gopala Guru Mandir. Temple is small and difficult to find, so it would be a good idea to visit there during day time. Srinivasa wrote a commentary on Srimad-Bhagvatam. The commentary is highly respected among the members of Gaudiya Sampradaya. Srinivasa wrote only five songs, but they are full of divine bliss. Most famous is Sada Goswami Ashtaka, a prayer to the Six Goswamis of Vrindavana. of anyone. Whatever they do, they are all-pleasing to everyone, and they are fully blessed by Lord Caitanya. Thus they are engaged in missionary activities meant to deliver all the conditioned souls in the material universe. Srinivasa Acharya stayed in Bengal for some time and then permanently settled at Vrindavana. He missed his pastimes with Lord Caitanya in the spiritual sky. He knew that the time for his disappearance was approaching fast. Jiva and all the senior devotees of Vrindavana had disappeared by now. There was no need of further life anymore. Life without association of devotees is not a pleasurable one. Not much is known about his disappearance, but with respect to the the other important events of that time, we may conclude that he disappeared in early half of the second decade of the 17th century in Vrindavana. His Samadhi is located in the compound of Jula Thakura temple in Vrindavana. Tombs of Ramachandra Kaviraja and Hemalata Thakurani are next to his Samadhi. Srila Narahari Chakravarti tells about this Acharya in his work, “Bhakti Ratnakara”.